Since the release of Black Sabbath's debut, "Black Sabbath," countless Metal recordings have featured striking panoramic-shaped graphics on their front/back sleeves. Usually, the right portion of these images (the front cover) is the one that receives most of people's attention. However, in many cases, the left sections—commonly known as 'back sleeves'—tend to be as visually and thematically important as the front and reveal new layers of meaning and artistic intricacy. Just think about timeless album artworks like Iron Maiden’s “Somewhere In Time,” Saxon's "Crusader," Mastodon's "Once More 'Round The Sun," or the aforementioned Black Sabbath’s debut and you’ll get the idea. Below, we're exploring six of 2016's most relevant panoramic Metal album covers. We talked to bands and the designers about making-of process and meaning behind these mesmerizing images that have already become part of heavy music's visual legacy. BEASTWARS "The Death Of All Things"
New Zeland-based sludge metallers, Beastwars, employed the unrivaled artistic talents of fellow countryman, Nick Keller, for the creation of the amazing artwork that adorns the front/back sleeves of band's new album "The Death Of All Things." 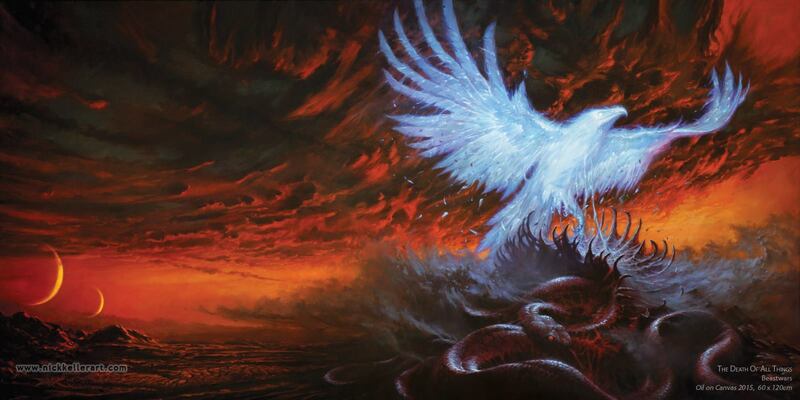 The imposing 60cm x 120cm oil on canvas painting is based on the legend of the Phoenix bird—but with a new twist. "In discussions around the visual direction, Beastwars' vocalist, Matt Hyde, revealed strong themes running through the album—songs dealing with trials of life through vice, damnation and possible redemption; a complete sense of running out of time and how, like death, all things can change in an instant," Keller explains. "No ending is perfect, strewn with unfinished hopes, ambitions and dreams. While that does sound grim, we wanted to express an impacting sense of power and optimism with the cover art." Having designed the covers for the band's previous recordings definitely gave the artist freedom to explore certain themes—including the Phoenix idea. "I thought the idea of a twist on the mythological Phoenix presented an interesting metaphor for a number of these themes. Unlike the classical creature, birthed from the ashes of it's predecessor, our bird should be bursting forth from the belly of the serpent." "The Death of All Things" is available via Beastwars' bandcamp. Kvelertak collaborated on their first two album covers with American musician/illustrator, John Baizley of Baroness. For their third full-length, "Nattesferd," the Norwegian combo decided to change their visual aesthetics and joined forces with legendary artist, Arik Roper. The American visionary would develop a haunting, Sci-fiction-inspired landscape that also incorporates Nordic motifs. 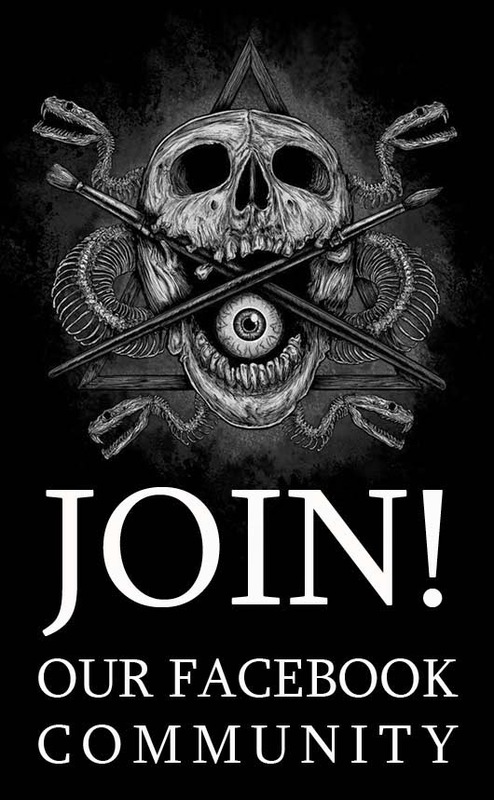 "I came up with the concept, though I asked for input from the band," Roper—known for his artworks for Sleep, High On Fire, among others—reveals. "They suggested the Owl because they apparently use owls as an ongoing theme. I liked the idea of combining Norse mythology with Science Fiction elements. So I thought of a futuristic character within a fantastic environment and the tree of life, Yggdrasil, as part of the world." The alluring, blue-dominated illustration was created with ink, gouache, and pastel. "Nattesferd" is available via Roadrunner Records. Italian fierce quartet, Hierophant, combined efforts with fellow countryman, Paolo Girardi, to create the artwork for their new album, "Mass Grave." The wild visionary painter delivered a chaotic, red/crimson-dominated piece that features most of his visual trademarks—including apparent disarray in the composition, exploration of apocalyptic themes and a confluence of grotesque, violent and supernatural visual elements. "Hierophant wanted a totally red artwork," Girardi comments. "For the front side (right) I've thought of Italian crypts under churches (columns and vaults), Italian cemeteries mixed with the hill of crosses in Šiauliai, Lithuania Many corpses as in many war (or drug trafficking) scenes. The big eyeballs give a human, deep, sick, insane, obsessive, delirious accent to the scene." The artist used oils to create such apocalyptic vision. He confesses that the left portion of the artwork (the back) was mainly "inspired by Luis Rojo's apocalyptic landscapes with water and post-atomic ruins, joined with Turner's romantic views of Venice or London. The tower of houses in the middle has been inspired by many Italian southern picturesque villages, clanged to spurs." "Mass Grave" will be available via Candlelight Records. TEMPLE OF EVIL "The 7th Awakening"
Released on CD early this year, "The 7th Awakening"—the debut of Cyprus-based black metallers, Temple of Evil—features a cover art depicting an obscure, cryptic ritual. It was crafted by the artist known as Khaos Diktator Design. "The main ideas for the artwork came into existence several years ago," the band comments. "It was obvious to us that the artwork needed to reflect the general atmosphere of the songs, conveying the appropriate dark feelings and ideas on to the listener and viewer, as both music and art need to be equally complementary and representative of each other." According to Khaos Diktator, he got "brief instructions from the band concerning the concept and atmosphere which was expected from me to achieve with my art. After that I listened to the album tracks while trying to create clear visions which will be transformed into painting later. This album was pretty inspiring and it was easy to translate it on canvas.Temple of Evil creates occult, ritualistic atmosphere, so I figured out that fusion of baroque technique and images that I achieve while listening to their music came out as perfect recipe." "The 7th Awakening" can be streamed and downloaded at Temple Of Evil's bandcamp. 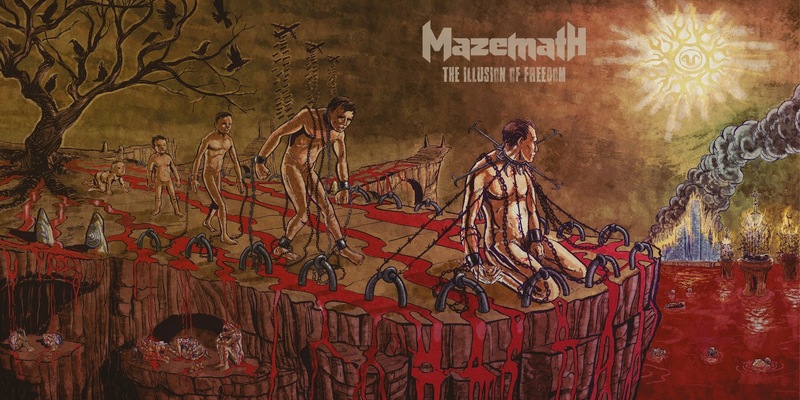 MAZEMATH "The Illusion Of Freedom"
"Creating this cover was really challenging in terms of bringing to life the different views and ideas of the band," reveals Scotland-based artist, Gabriel Hernández regarding his artwork for "The Illusion Of Freedom." This is the debut album by novel Chilean metallers, Mazemath. "The main concept they asked me to illustrate was a human timeline from baby to a defeated man, was only the starting point," Chilean-born Hernández says. "There were other ideas they wanted to incorporate: a group of girls in fetal position and a burning city. Since all these elements needed to have their own level of importance, I suggested them to create an extended cover, basically to enhance the main concept and give coherence to all these elements and build a consistent world." Expanding on the cover concept, the band comments: "The lyrics [of the title track] talk about growing up and realizing that the game of life is not what they told and you are not free at all. The classic image of the monkey evolving into man came to mind. Every element in the art has to do with some track of the album: the bombers, the numbed bodies, the tree and the crows, the sun is really Apophis 99942 (an asteroid that may clash the earth), the burning city has some iconic building of Chile’s capital and the iron necklace was a torture device that was used on slaves." Hernández adds that "working digitally allowed me to manipulate elements at every stage of the process such as sketches, line art and final color, until they were happy with the result. I like to state that this project was definitely a collective effort rather than an illustrator’s vision." "The Illusion Of Freedom" will be released on September 30, 2016. Originally released in 2004, "Vozrozhdenie" ("Revival") has become a landmark in the career of Russia's premier Folk Metal collective, Arkona. Fast forward to 2016, the band decided to re-record the album and appointed celebrated illustrator Kris Verwimp with the task of painting a new cover art. Verwimp (well known for his involvement with many Folk and extreme Metal projects and as the creator of mythical character, Odoric) started painting the ambitious panoramic artwork in 2015, using acrylics and water mixable oils on paper. "The moment is etched in my memory when I heard "Vozrozhdenie" for the first time," he comments. "I was awestruck by the phenomenal vocals and wonderful songs. Who would have known back then, that I would one day be painting a cover for a re-recording of this album?" According to the artist, "the painting itself is a re-imagining of the original artwork in my own style. 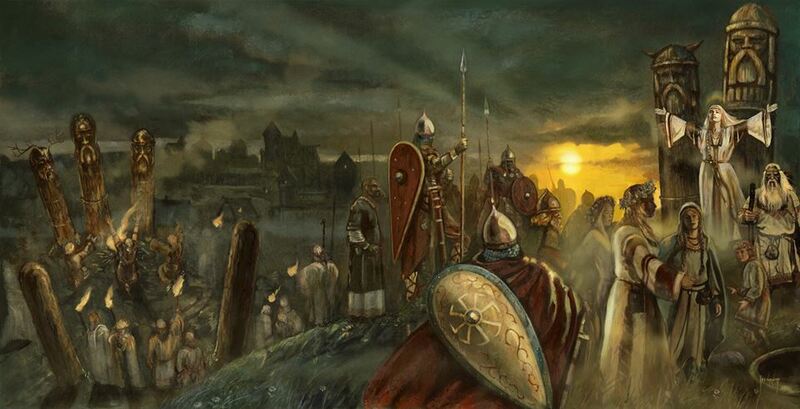 It depicts a Pagan celebration scene with a Slavic princess, warriors, priests and idols. Unfortunately I wasn't able to find out what the little insect creatures at the bottom represented, so I left those out. I also did illustrations for each song on the album." "Vozrozhdenie" will be released on November 11th by Napalm Records. 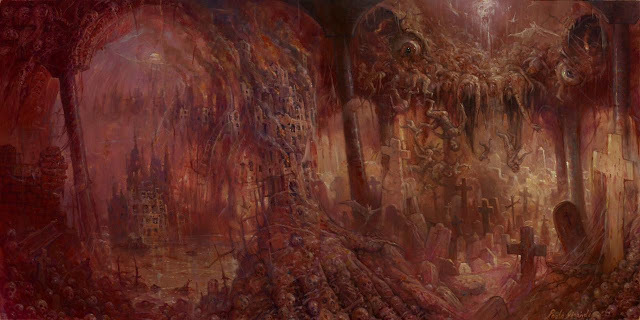 The eerie panoramic artwork for Usurpress new album, "The Regal Tribe," was painted by Marald Van Haasteren of Marald Art. Exclusively for And Justice For Art, the Swedish metallers reveal that they "sent Marald the lyrics and the synopsis for the storyline of the album and gave him freedom to create something based on one of songs of his choice. He chose the track "Across the Dying Plains" and the painting is his interpretation of what it would look like. 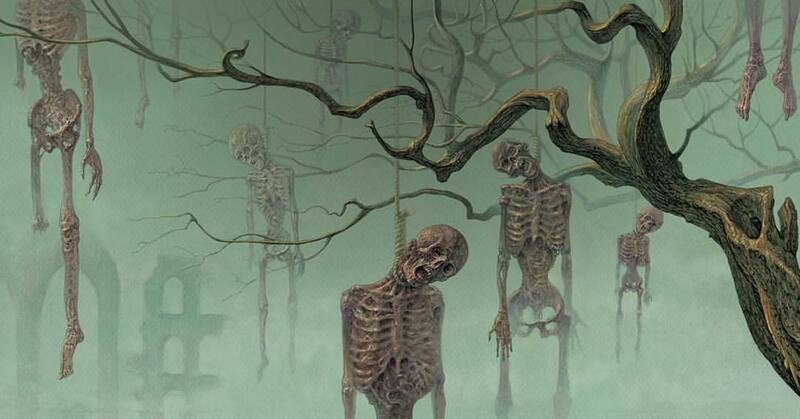 Those who are familiar with his art know that the skeleton, and especially the skull, is a recurring theme in his paintings. I think it's very important that the artist feels that he/she are allowed to do what he/she wants to do instead of just doing something that the band has already decided. The result will always be more alive and inspired." "It was an absolute pleasure working for [the band]," Marald recently said. "Thanks again for all the artistic freedom and trust." "The Regal Tribe" is available via Agonia Records. The cover for Ihsahn's "Arktis," is basically a rework of old photo of Norwegian explorer Fridtjof Nansen, taken during his three-year expedition to the North Pole. Such stark visual approach is a continuation of the photography-based aesthetics Ihsahn and Spanish graphic artist, Ritxi Ostáriz have developed on the covers of the musician's previous albums. "As always, it's been an amazing pleasure to work for Ihsahn," enthuses Ostáriz. Before "Arktis," he designed the artworks for "Eremita" (2012) and "After" (2010), among others—usually using a similar aesthetic approach. "Arktis" is available via Candlelight Records. 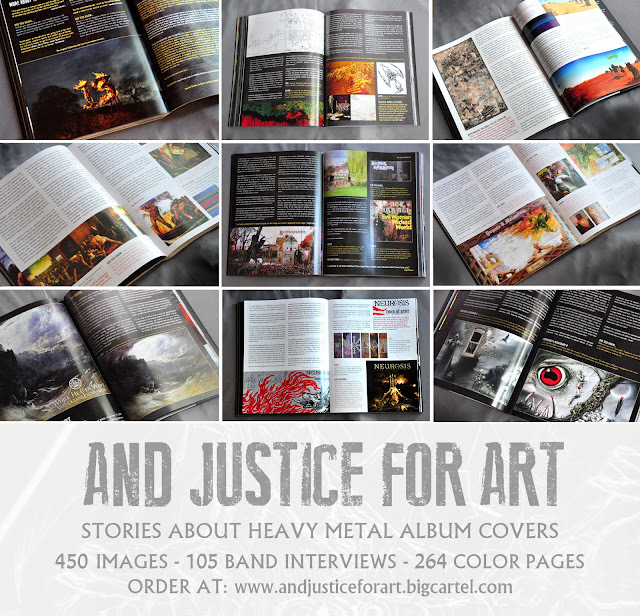 If you want to know more about the making of some of Metal's most iconic panoramic album artworks—like Black Sabbath's "Black Sabbath," Sleep's "Dopesmoker," Obituary's "Cause Of Death," Neurosis' "Times Of Grace," "Cathedral's "The Carnival Bizarre," Skid Row's "Slave To The Grind,"—check out the book "...And Justice For Art: Stories About Heavy Metal Album Covers" and dare to explore this fascinating topic even further. The book is available exclusively via our online store at BigCartel. The thing I like about this art is the very deep and detailed pieces in the art. Just like the white eagle and snakes together in the first one. Would love to read more about them. I like that specific atmosphere in those paintings. As a https://classyessay.com writer I like to listen to music while working. But I haven't time to spot the album covers during work. So I didn't knew how they look, even though I'm fan of Blind Guardian. Happy that I coul see them because of your blog. Hello, you are really a good webmaster. The web site loading speed is amazing.